I was talking to my mom a few weeks ago, and she was about to make a chicken pot pie, the ultimate comfort food. That sounded like a great idea, plus K and I have been trying to come up with some “go to” recipes so that each week when we start menu planning, we don’t have to start from scratch and can get our grocery list done more quickly. Ideally these recipes will be tasty, healthy, quick/easy, not too expensive, and increasingly, vegetarian. I thought a chicken pot pie would be a perfect addition to the arsenal — well, it fits four out of the five criteria anyway. So I decided to make some for Sunday dinner. I used the Pillsbury recipe and chicken thighs. I boiled the chicken thighs, let them cool, and then Snaggle and I pulled the meat off. 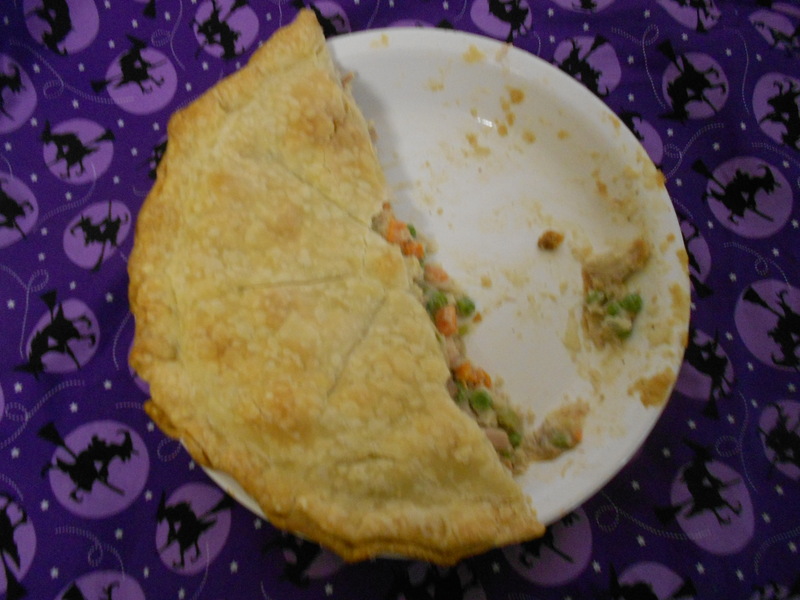 Half of a chicken pot pie. I forgot to take a picture of the pie when it first came out of the oven,but it was gorgeous, let me tell you. A ready-made crust can work miracles. I did remember to snap a pic when it was half eaten, before we stored it for leftovers. Because it fits the season, I used the fabric from Snaggle’s Halloween costume as the background. 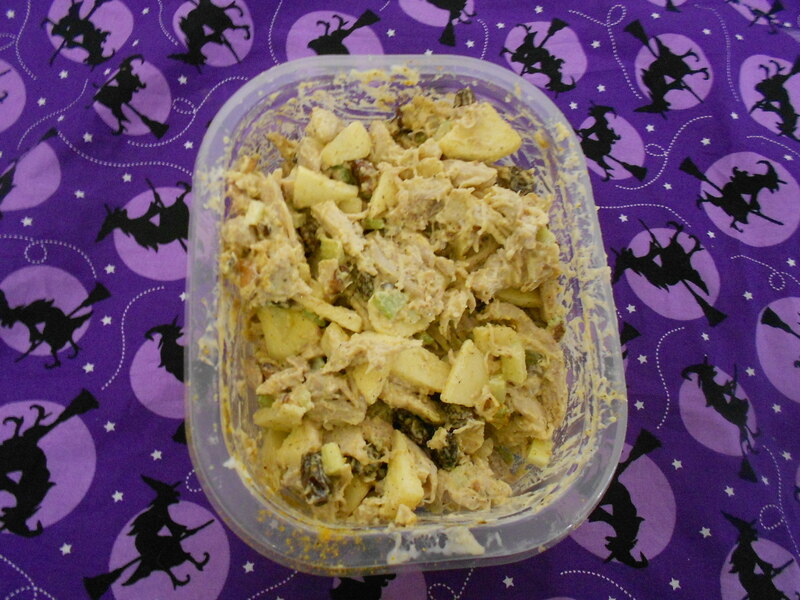 And as a bonus, there was some cooked chicken left over, and I had the inkling to make curried chicken salad. I’ve made this before, but hadn’t done it in a while. I mixed in some mayo, garam masala, curry powder, raisins, apples, celery, walnuts and salt and pepper in with the leftover chicken. I just guestimated everything. The celery and walnuts add a crunch to balance out the texture of the chicken, and the raisins and apples add a nice sweetness to balance out the curry and garam masala. I put it in a wrap and had it for lunch on Monday and Tuesday. Yum. This entry was posted in Cooking, Recipe, Uncategorized and tagged Curried chicken salad, easy chicken pot pie, two meals out of one on October 27, 2011 by crunchysoul.